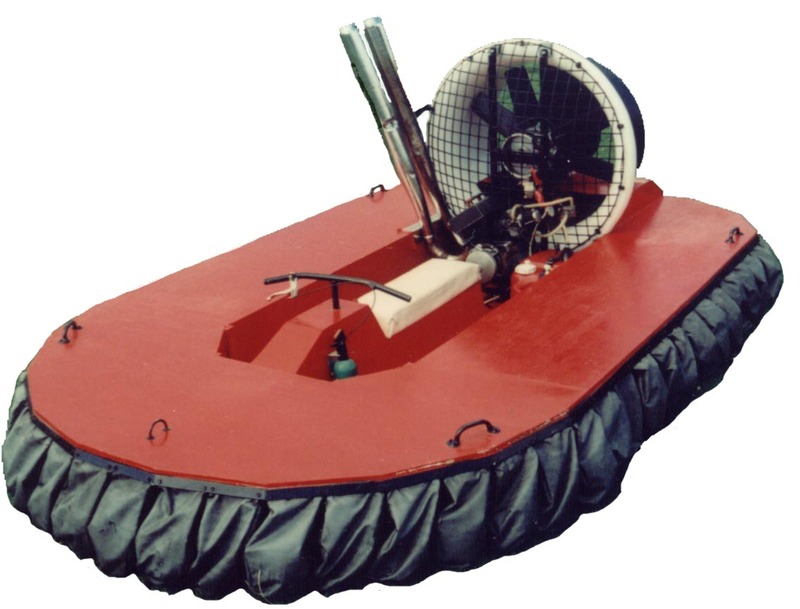 The Eagle 1 is a "do it yourself" 1 or 2 seat hovercraft. Two people can ride in comfort on the tandem (motor bike) seating with handle bar steering and lever throttle. The craft is fitted with a segmented type skirt i.e. 59 separate segments for ease of replacement when they are worn or damaged. The craft has been designed with the option of using either of the engines shown on the plans, the Rotax 253 and the Yamaha RD 250 in air or liquid cooled versions. Any other engine may be used to power the craft which provides a similar power to weight ratio. The Yamaha RD250 is ideal for racing, with a power output of 30 to 35 bhp depending on the model used. These engines can be bought second hand for about £200 to £350. The Rotax 253 is a single cylinder air cooled engine with a power output of 22bhp which is ideal for school projects and youth groups because of simple mechanicals. 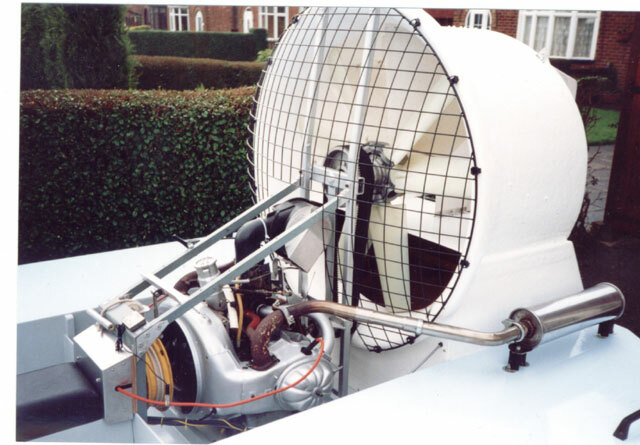 The Eagle 1 has been designed by Ken Rigley who has over 25 years of experience of building and designing hovercraft, many of which have won national championships over a number of years. The Eagle 1 can be used for both leisure and racing, it is also an ideal craft to build as a school, youth club or scouts project as it combines the skills of wood and metalwork. The craft is constructed mainly from plywood and soft woods with the use of a few tools. The plans consist of 5 sheets of 30" by 40" drawings and a comprehensive step by step guide to help you. We keep most of the components required in stock, so if you haven't the facilities to make items such as engine frames and pulleys etc., they can be purchased from us. The Citroen 2CV engine can be used in the Eagle 1 as an alternative power plant. The picture (above) shows an installation with a 900 mm duct and the Eagle 1 stretched by 300 mm to compensate for the greater weight.